Ireland no longer has a king but Dublin still has a regal palace. Dublin Castle was the seat of British power in Ireland from medieval times until the formation of an Irish state in 1922. In addition, it was built to be a residence for visiting British royals and to house the court of the British viceroys. While not as elaborate as Versailles or Buckingham Palace, Dublin Castle is a palace. Today, the Irish government continues to use the Castle for state functions and ceremonies. Recognizing its historical and cultural significance, it has preserved - - and restored where needed - - the Castle. In addition, it has incorporated treasures from other Irish buildings in a manner that harmonizes with the Castle. The Castle is a popular tourist venue. 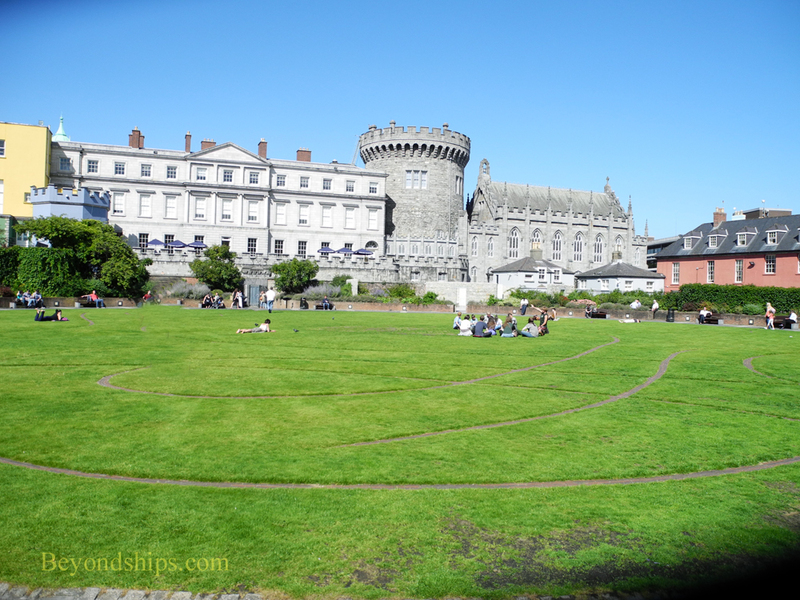 It is in the city center and thus very easy to get to from most of Dublin's other major attractions. Covering 11 acres, you can explore its grounds, the Chapel Royal, the Chester Beatty Library (oriental art and manuscripts), the Garda (police) Museum and the Revenue Museum, free of charge. There is a charge to visit the State Apartments, which are the highpoint of a visit to Dublin Castle. Dublin Castle dates back a long way. It was commissioned by King John in 1205 not that long after the Norman Invasion of Ireland of 1169, which first brought English rule to Ireland. The Anglo-Normans had built a fortress on this site already but John wanted a stronger structure to defend the city, be a center for the administration of justice and to secure treasure. Completed in 1230, this castle roughly corresponded to the courtyard of today's Castle. The Castle was in an excellent defensive position. It was on a ridge at the junction of the River Liffey and the River Poddle (now underground) and so had natural protection on two sides as well as the advantage of being on the high ground. The English built formidable stone walls and towers. 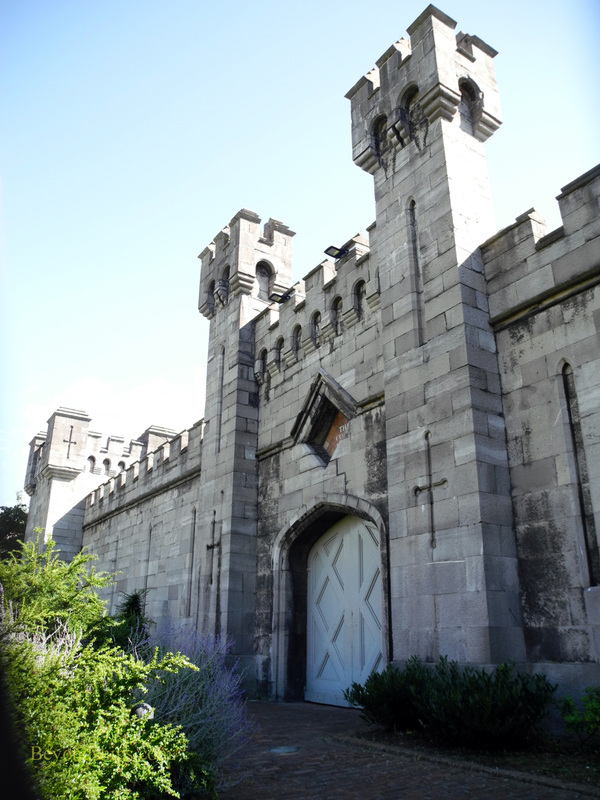 Perhaps because of its strength, the Castle's role shifted over the years from a defensive position to being the center for English administration of government in Ireland. In 1684, a fire swept the Castle. King James II ordered much of the remaining medieval structure to be torn down and a palace built in its place. This construction continued well into the next century, giving the Castle the Georgian look that we see today. At the same time, the Castle became the center of a lavish and glittering viceregal court. This included weeks of balls, levees, and dinners enjoyed by the upper class Protestant Ascendancy. This social side of the Castle continued through the 19th century. Following the 1798 rebellion and the subsequent Irish Act of Union, the real governmental power over Ireland shifted from the Castle to the central government in London. The viceroy became more of a figurehead. Although the viceroys continued to hold court in the Castle, the viceregal residence shifted to a building in Phoenix Park. 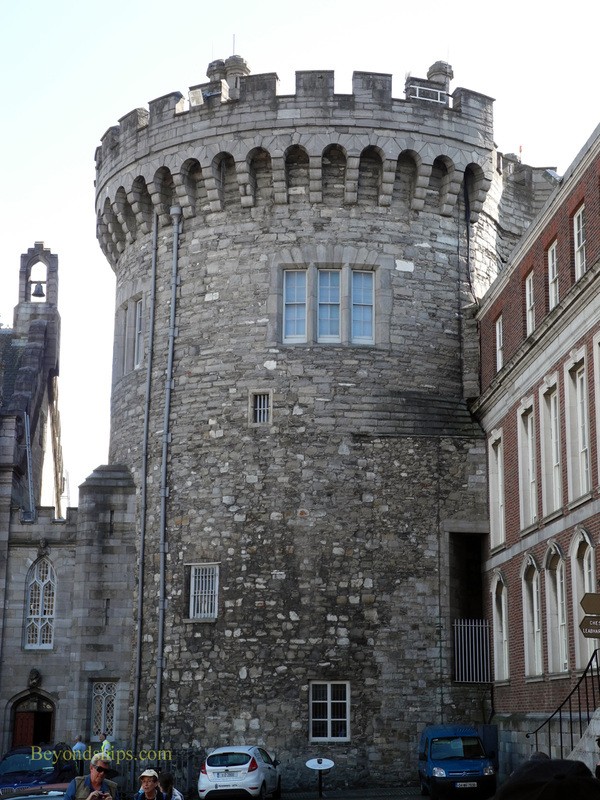 Dublin Castle played only a minor role in the fighting during the Irish War of Independence. In a moment of symbolic importance, on January 18, 1922, revolutionary leader Michael Collins accepted the keys to the Castle from the Lord Lieutenant ending seven and a half centuries of English rule. The new Irish state used the Castle for a number of purposes. For example, it housed the courts for awhile, the Four Courts building having been damaged in the Irish Civil War. However, its primary use became ceremonial. Today, the Castle continues to be used for state functions such as for meetings of the European Council and for receiving heads of state. In addition, the Castle also plays a role as a modern conference center. Above: The Record Tower is the most visible element left of the original Norman castle. Its crenelation was added in the 19th century to make it look more medieval. Below: The Bedford Tower stands near where the gate to the Norman castle stood. The Georgian Great Courtyard (above and below) roughly corresponds to the boundaries of the original castle. Just outside the Castle is the Castle Gardens (also called the Dubhlinn Gardens) (left). 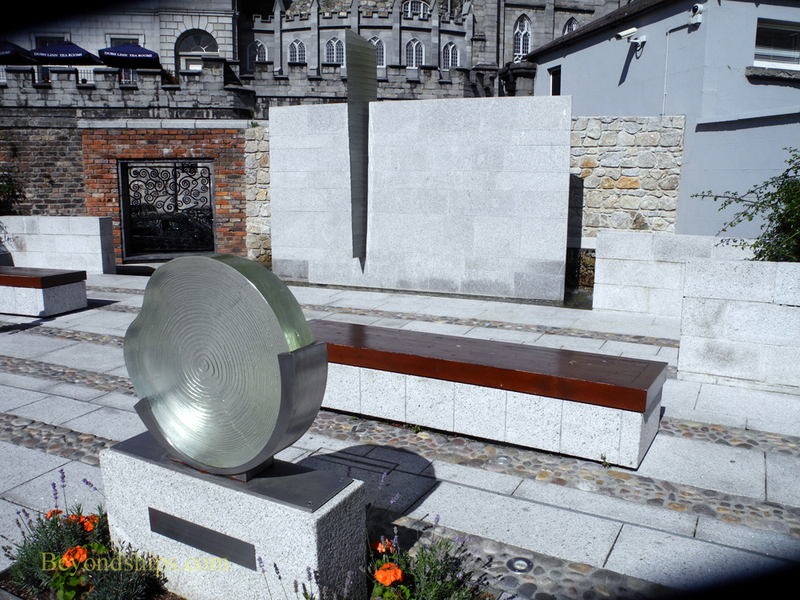 It includes a memorial to garda (police) officers (above) and the Coach House for the Castle (right).